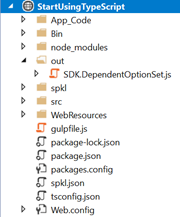 Re build the solution so that the new config is picked up and then make a small change to the TypeScript file - you should now see a new folder out if you refresh the Solution Explorer. The great part about this is you can now start to split your TypeScript code into multiple source files, remembering that you'll need use the export keyword on the classes to allow them to be used across separate source files. Open the command line from the project using Alt-Space. Gulp watch is used to monitor the source file for changes and uglify when it changes. Click 'Refresh on the task runner explorer. We can manually run the watch to start monitoring the out file – but also configure to automatically start when the project opens. 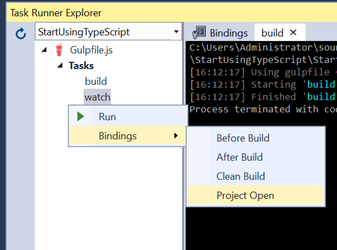 You can download the code from this part if you want to compare your code to mine.In the next part I'll show you how to create some Unit Tests for our TypeScript code.